The story opens with Elise Dalriss’s great granddaughter telling a story to the other kids- a story about a fair maiden- Sleeping Beauty. Elise is uneasy with this story being told- but she doesn’t say anything to her great-grandaughter, until Elise finds her searching her room and holding a special knife. Elise sits the girl down and begins telling a story- a story of wonder, of love, of betrayal and pain. Elise, a young lady living on a farm, longs for a different life. Farm people usually do not get to live a different life- but Elise dreams about the castle- and hopes that one day, she will be a part of the life there. After managing to survive the pox that decimated her family, Elise goes to the castle in search of employment and by using her mother’s name- is able to get employment as a chambermaid. Quickly young Elise takes to life at the castle- and is rewarded by moving up the ranks, until she is the Queen’s personal attendant. The Queen and Elise develop a friendship and Elise vows to be there for the Queen’s child- a child named Rose. Most of the kingdom is happy that Rose has been born- happy and healthy and one day will be the leader, the ruler of the kingdom. Not all are happy, though. Millicent, the King’s sister is not happy- as she feels she is the rightful heir to the throne. After Milicent puts a curse of Rose, she is banned from the kingdom- and life becomes changed in the castle. The King and Queen are worried for Rose’s future and Elise worries that Millicent will exact her revenge on Rose. As the story unfolds and the reader finds out what happened- does Millicent exact her revenge? How far will Elise go to protect the beautiful Rose? What will Elise give up to for Rose to have the life she was born for? While Beauty Slept takes what you, the reader, knows about the tale of Sleeping Beauty and creates a story that is engaging, lovely, and filled with wonderful characters and prose that will stay with you long after the last page is turned. When I received an email asking to consider WHILE BEAUTY SLEPT for review, I jumped at the chance. I love fairy tales and particularly love SLEEPING BEAUTY. I was curious to see how this story would be retold and how much would stay true. While the book WHILE BEAUTY SLEPT had flavors of the Disney movie, SLEEPING BEAUTY, this book is so much more. It’s a tale that grips you from the early pages. Beautiful phrasing, chapters that move along at a nice pace and an ample supply of plot twists to keep the reader entertained. 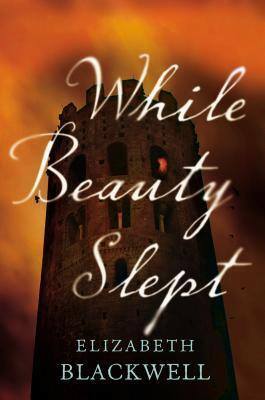 WHILE BEAUTY SLEPT, a loosely based re-telling of SLEEPING BEAUTY, does not have so much of a magical/fantasy feel as it does a historical fiction tinge. Which just increases my opinion of this book because it would have been so easy to take this story to a magical/fantasy type of place, but a historical fiction shows skill. Elizabeth Blackwell has a promising debut on her hands- and one that I am glad I was able to read. *Thanks to Amy Einhorn Books for providing Traveling With T a review copy in exchange for a fair and honest review. This is an interesting twist on a child’s book. I can’t wait to read it! I just posted my review of this today. I reeeeaaaalllyyy liked this one. Magical but not childish or sappy. I LOVED this book. LOVED. I was so involved in the storyline, so loving it! I agree- I was unsure where Elizabeth Blackwell was going to take this story- but the direction she chose— AMAZING! I loved this book too! The writing completely blew me away and I was sucked in by the plot twists too. I really could believe how good this was. AGREED. Like I just had a good feeling about this book from the description- but the writing, my gosh- the WRITING. I was completely captivated by story & was really peeved when life got in the way of reading because not only I wanted to know, I NEEDED to know what happened. I would love, love, love for this tale- this version to be made into a movie one day (I think).